Employees in the Amelia Booking plugin are those who perform a service. It is necessary to have at least one employee created for the plugin to work properly. 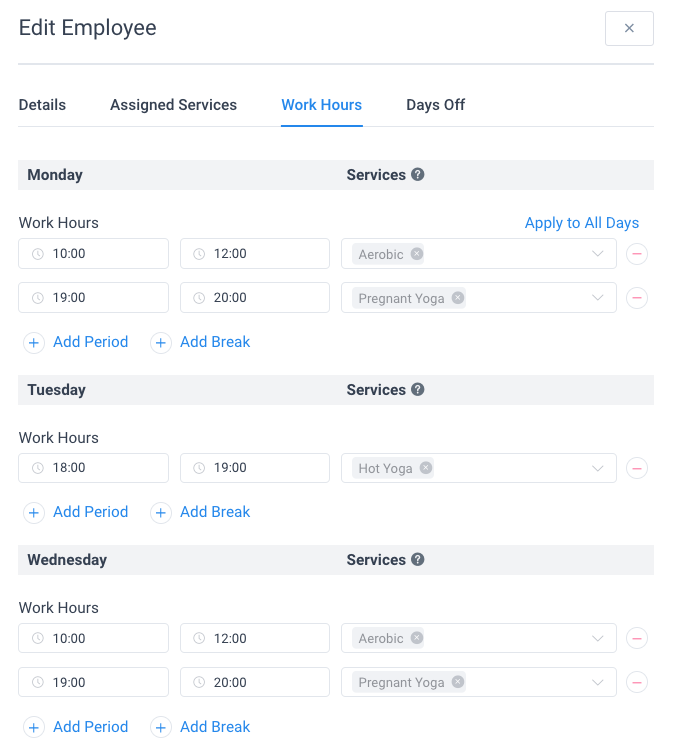 This option is specifically for companies with several employees to make it easier for them to manage and track their appointments, their availability, and the services they provide. If you have just one employee and you don’t want it shown on the front pages, don’t worry. When you create only one employee it will be automatically hidden on the front pages. 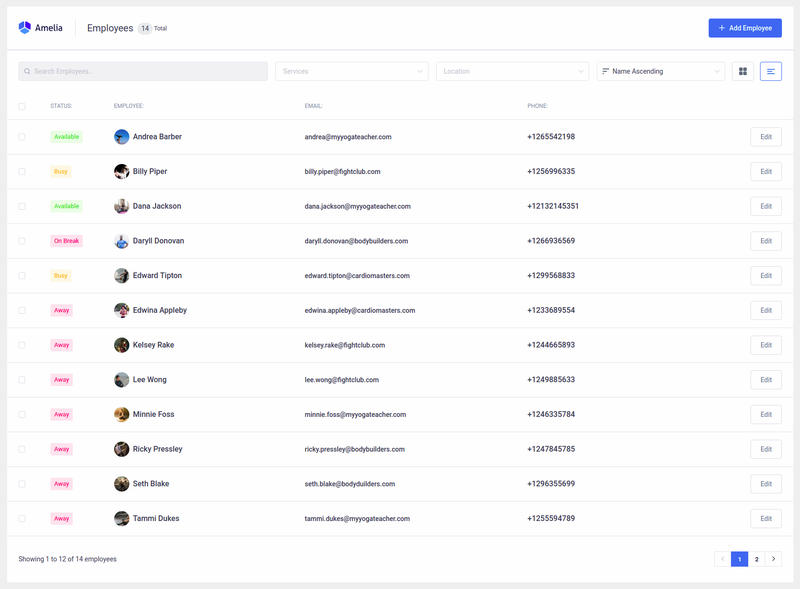 Details – is the first tab for creating the employee. Employee photo – for every employee you are able to set the photo that will be visible on both sides of the plugin – on the back-end so you or your manager can differentiate them easily, and on your website so your customers or clients can see them. First Name, Last Name, and Email are mandatory fields for every employee. Note that you cannot have two employees with the same email – if you enter the same email a second time, and try to save the employee, you will see a red alert under the email option that informs you about an already existing email. If you don’t create a location the location option will not appear in any settings, and it will not be visible in this modal as well. Let’s say your company is doing business in one location only, and you don’t want to show that location because it is the only one. You can create it and then hide it, but that doesn’t serve any purpose. So, you can simply skip creating the location. If you create just one location every employee you create will get this location. 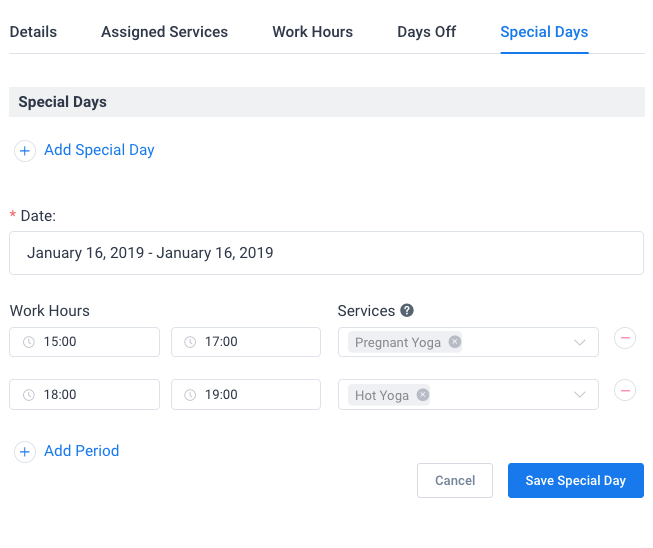 If your employees provide services at multiple locations, the Location option in the Employee modal becomes mandatory and you will have to choose a location for each employee. 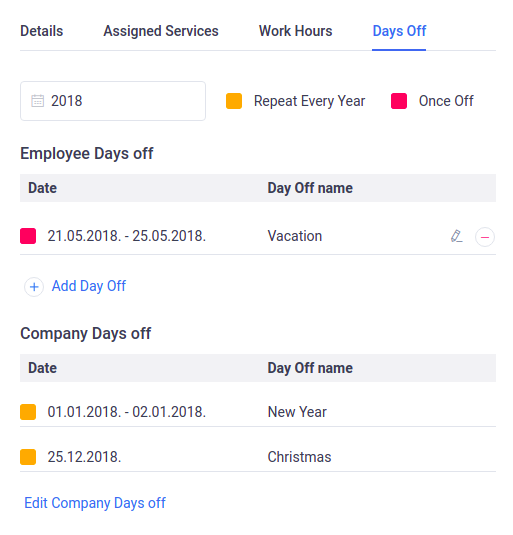 Google Calendar – where your employees can connect their Google Calendars, so once the appointment is scheduled it will be automatically added to their calendar. All they need to do is to click on the button beside the Google Calendar option and they will be redirected to choose their Google Account. 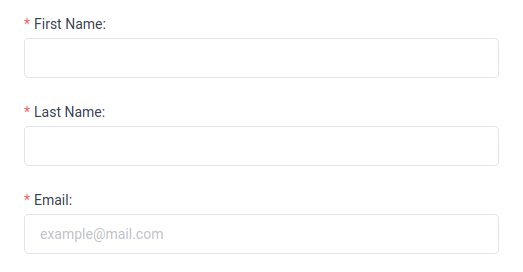 Once they choose it, they will be back on their profile in the Amelia Plugin with the selected Google Calendar email. Once the Calendar is connected the Google button will change in color, so you’ll know if the synchronization is working. Assigned Services – This is where you can check the services provided by at current employee. Each employee can have more than one assigned service and there is no limit on the number of services that can be assigned, i.e. all services can be checked. Once you check a service, the price and capacity inputs become available, allowing you to set a custom price and capacity for the employee. 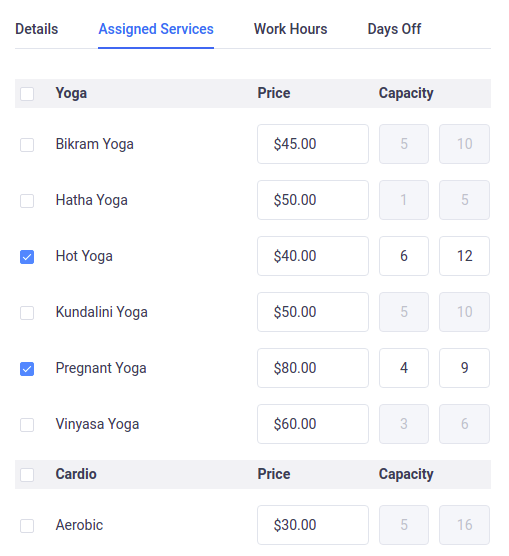 Please note: If you assigned a custom price and capacity for the employees, please be careful when you are changing this setting in the service. If you change price or capacity for that service you will see a message to choose whether you want to apply this setting only for the service or for the all assigned employees. If you click to change it for all employees you will override your custom employees settings. Once you’ve set it all, click on the “Save” button and your employee will appear on the “Employees” page. 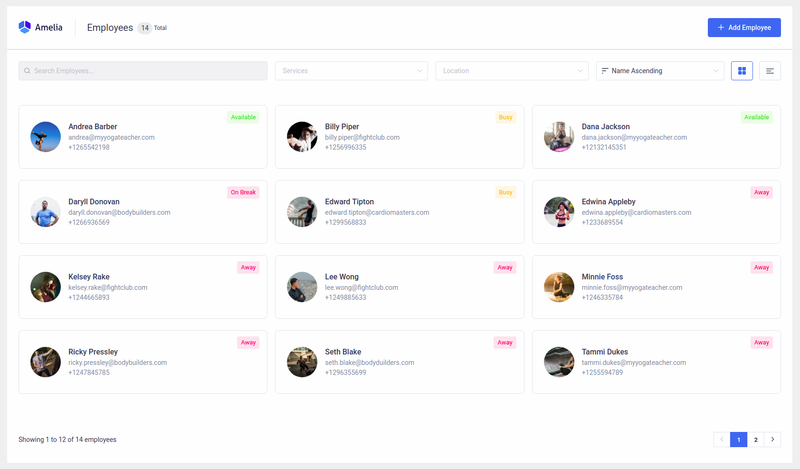 You can have one or as many employees as you need, and you can choose how to show them on the back-end of the plugin, and easily search or sort them. This is especially important for companies with a large number of employees. 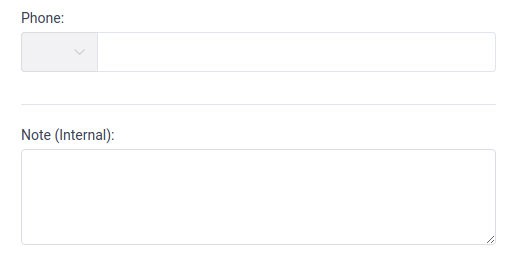 On the “Employees” page you have several search options: by name, by service, by location, and two options to sort them by name: ascending and descending. These options will make your search easier in those situations where you have a large number of employees. In both you will see an availability status for each employee, their name, email and phone number. In the list view you have an additional option – to mark and delete several employees at once. Click on the employee and the “Edit Employee” dialog will appear with three new buttons in the bottom left corner: “Duplicate”, “Hide” and “Delete”. While the “Duplicate” and “Hide” options are available for both, administrator and manager, the “Delete” option is only available for the administrator. The “Duplicate” option is the first of three and helps you configure the settings. If you have several employees with the same location, assigned services, working hours and breaks, you can easily duplicate the first one you’ve created, and just change the name, email and a few other if you need. In that way, you can create a list of your employees much faster. After you click to duplicate the employee and confirm this action, the copied version will open. The only difference is that this copied version will not enter email, as you cannot have two or more employees or customers with the same email address. With the “Hide” option, you can temporarily hide an employee from the website front-end, without needed to permanently delete him/her. You will find this option right next to the “Duplicate” button in the “Edit Employee” dialog. When you hide an employee it will still be visible on the back-end of the plugin with a hidden sign, but it will not be visible on your front website. Please note: If you hide an employee which was the only one assigned to the service and/or location, the service and/or location will automatically be hidden as well. By clicking on a “Trash” icon button in the bottom left corner of the “Edit Employee” dialog. By selecting it on the employee’s list and then clicking on a “Trash” icon in the bottom left corner of the Employees page. Either way, you can delete employees without any appointments or with only appointments in the past, but you cannot delete employees that have appointments in the future. Once you click on a delete button you will see a message that will inform you of the number of appointments and the ability to delete. Please note: If you delete an employee that has had appointments in the past, those appointments will be deleted as well.